“En 1989, je savais faire du bruit… aujourd’hui, je sais faire de la musique” one of the many statements made by Michel Chapoutier, grandmaster of the Rhone wines. The history of the family Chapoutier goes back to 1808. Today they own more than 240ha vineyards in the Rhone Valley. When Michel took over the rudder from his father Max in 1989, he immediately put a stamp on ‘His’ wines. For example, they often work bio-dynamic and Michel prefers monocépage wines. This to combine the true expression of the vine with the unique characteristics of the available terroirs. Out of respect for the nature of his wines, he bottles unfiltered. Michel himself is responsible for the vinification of his wines, although he can always count on the opinion of his oenologue Alberic Mazoyer. His desire to improve, underlines his constant renovation and innovative winemaking techniques. For example, he recently renewed his installations and in 2010 he plans to build a complete new cellar. 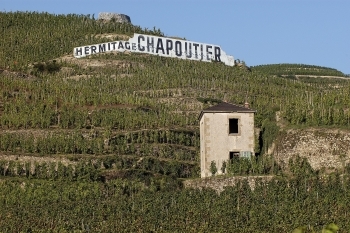 There is no doubt Chapoutier is worldwide known for his Hermitage, of which he has 33ha vineyards in ownership. The average age of the vines is between 75 and 80 years, which makes it very low rate of return. Of course, this is the only good quality! His red Cru’s come from the Syrah grape and the white from the Marsanne variety. The grapes are undone from all its seeds to evade excessive and a rather bitter taste. In Châteauneuf du Pape , where he owns the domaon “La bernardine”, where he creates a special Cru “Barbe Rac”. This 100% Grenache wine comes from a small parcel which was planted in 1901. Here too small yields are no exception. With an annual production of 6,000 bottles, we should rejoice to have a few bottles in our cellar. 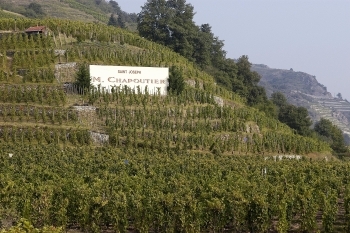 Michel Chapoutier also proved his skills in other regions by creating special Cru’s. In Côte Rôtie we find the red “La Mordorée”, in Crozes-Hermitage, the red “Les Varonniers” and, finally, in Saint-Joseph “Les granits”, both in white and red. The red wines yet again 100% Syrah and 100% Marsanne for the white wines. Other appellations like Cornas or Condrieu don’t scare Michel Chapoutier. Even less known appellations like Coteaux du Tricastin or Saint-Péray don’t stop him. In these regions of course there is use of other grape varieties like Viognier, Grenache Blanc or Bourboulenc for the white wines and Cinsault, Mourvèdre and Carignan for the reds. Even in the appellation Côtes du Rhone he produces his beautiful” Belleruche” and scores high marks each time he enters in many wine competition. Recently Michel Chapoutier stepped outside his trusted Rhône and bought the wonderful Bila Haut domain in the Languedoc area, situated in the small and cute village Latour de France. Here he produces since 2006 v.i.t. (Visitare Terrae Interiore) as special Cru. Even the more price friendly Vignes de Bila Haut and “Occultum Lapidem” are regarded very highly by a lot of wine journalists, including of course, Robert Parker. This success didn’t keep him to participate in Australia in a joint venture with John Terlato, who is very well known in California for his excellent Syrah wines. The 2 specialists eminently emerged to produce the excellent ‘Lieu Dit Malakoff ’, naturally a 100% Syrah wine, as a fantastic result.